Earlier this week I had a chance to visit with Tom and Jim Collingham at Colonial Needle in White Plains, New York. 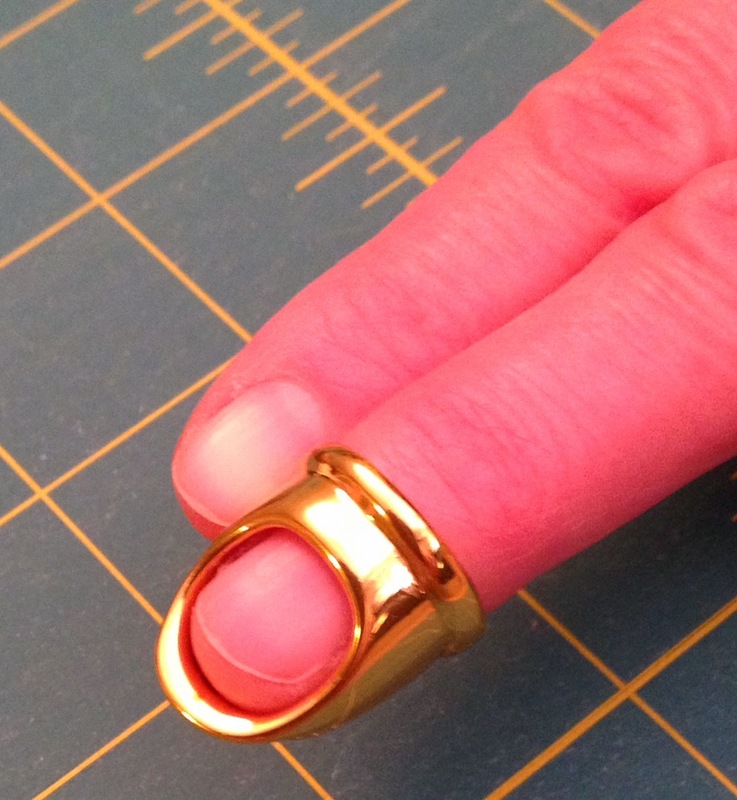 They showed me their new quilting and sewing thimble, the Roxette, which comes in five playful colors. Each color represents a different size; purple – extra small 4 1/2, pink – small 5, yellow – medium 5 1/2, green – large 6, and blue – extra large 6 1/2. Which colors are the most popular? If you guessed yellow and green, you would be correct, because they represent the most common sizes. Measure in metric or inches, but metric is more accurate. 1. Wrap a narrow 1/8” strip of adhesive tape or paper around the first knuckle. 2. Place a mark where the end rests against the wrapped strip. 3. Remove the tape or paper strip from finger and measure its length from the end of the strip to the marked point. Repeat this process a few times until you are consistently getting the same measurement. 4. Select the corresponding size closest to your measurement. 1. Wrap a narrow 1/8” strip of adhesive tape or paper around the midpoint between the first knuckle and the nail bed. 3. Remove the tape or paper strip from your finger and measure its length from the end of the strip to the marked point. Repeat this process a few times until you are consistently getting the same measurement. 4. Select the corresponding size. 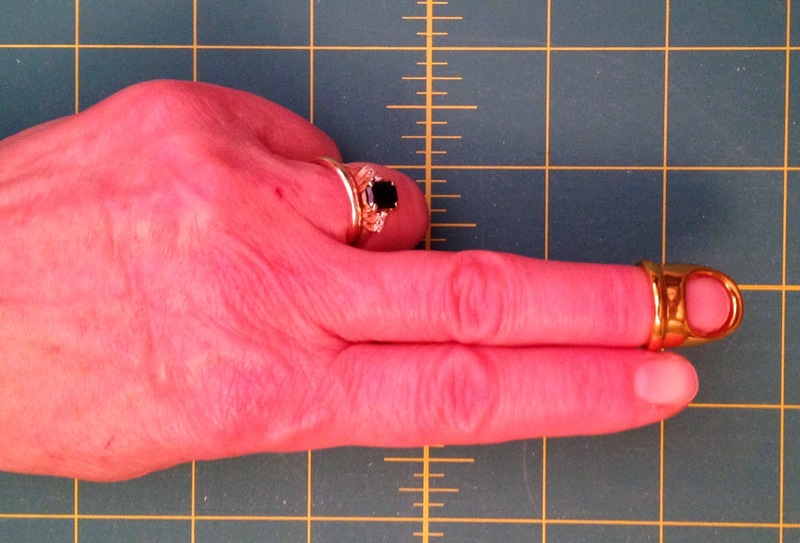 If your measurement is between two sizes, select the smaller size. 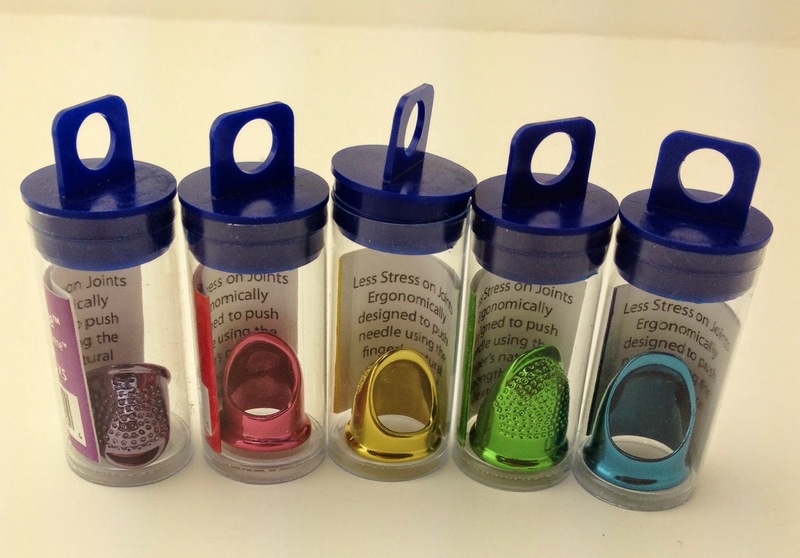 These colorful, new zinc electro-plated thimbles sell for $19.95. The advantage to using the Roxette, is that it is so much lighter, and it never seems to fall off my finger. 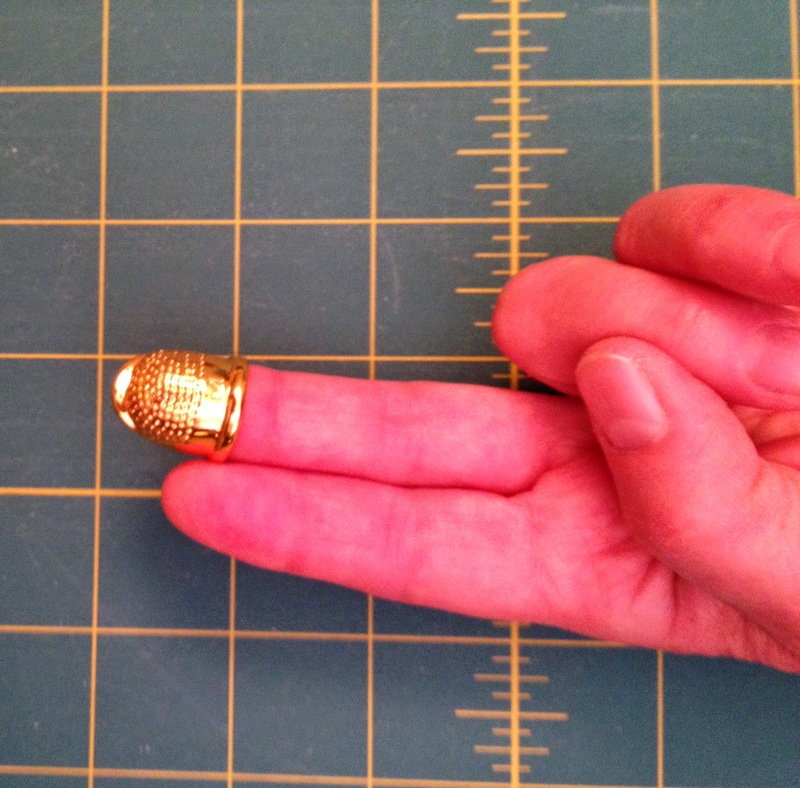 My raised edge thimble feels much heavier, which I’ve been using for 20 years. Even though it’s the right size, it often falls off while I’m sewing, which interrupts the rhythm that hand quilters count on and enjoy. Do you notice the grooves, that keep going over the finger tip area until the lip? Those grooves work in the same way as the top of the raised edge. The open back pleasantly accommodates long finger nails. As I mentioned, I have used a raised edge thimble for hand quilting. 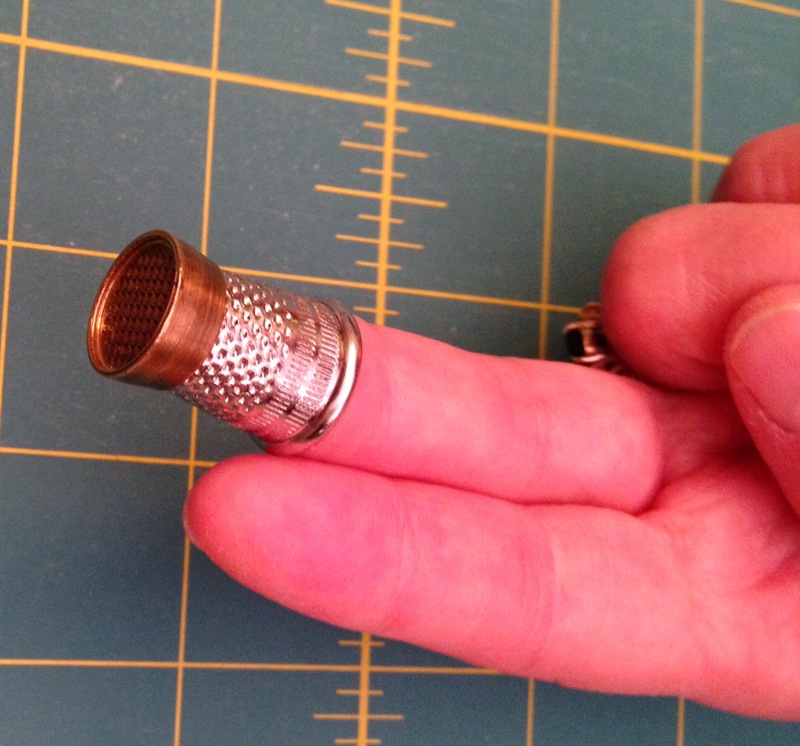 Generally, I don’t use a thimble for regular sewing, but I know many sewers that do. I used it while hand quilting, and I have to say it is lighter and easier to use than my raised edge thimble. You know how we can all be reluctant to change? Now I’m a convert. Roxanne and her daughter, Deirdra McElroy sold the Roxanne product line to Colonial Needle about 5 years ago. Through a correlative effort between Ms. McElroy and Colonial Needle, the development of this new thimble was invented. In marketing jargon, it’s a line extension from their more expensive line of thimbles, that run from $60-$130. They come in gold, sterling silver, silver plated and bronze. The Roxette and the silver and gold thimbles can be found at local, independent quilt shops. 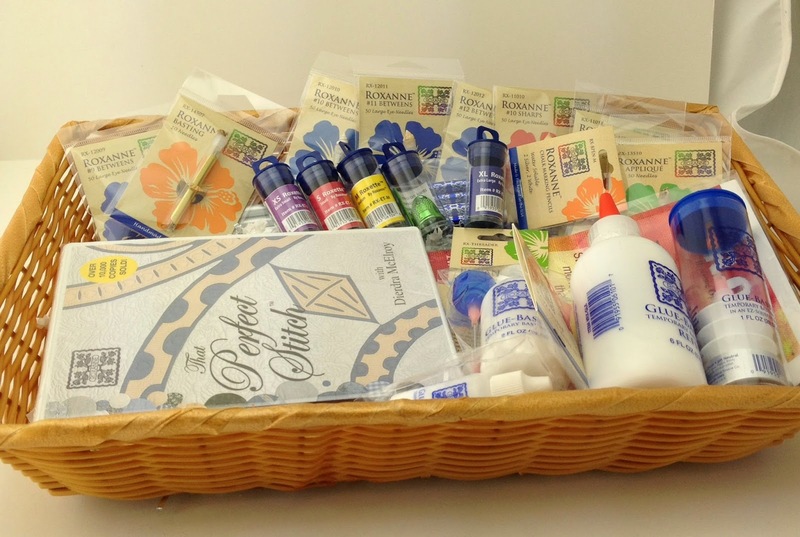 This lovely give-a-way basket, courtesy of Colonial Needle, will go to one very lucky winner. 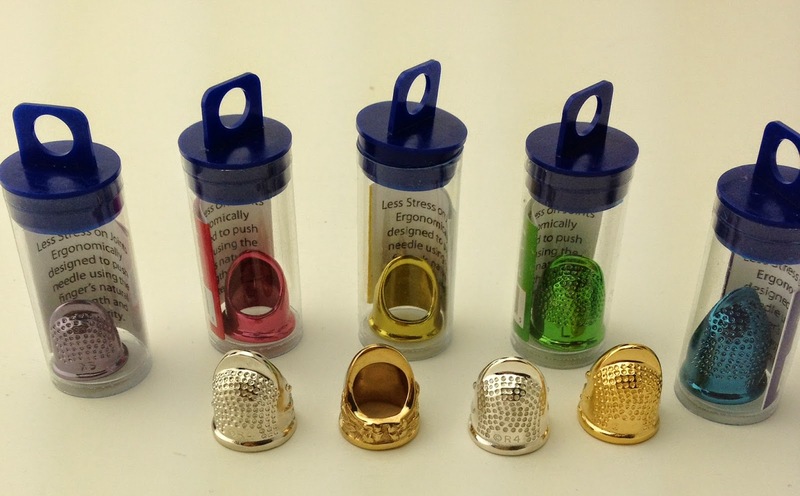 Please leave a comment in my comment box telling us; when purchasing a thimble, how do you pick a size, when you can’t physically try the thimble on? If you don’t use a thimble tells us what your favorite notion is. This give-a-way ends on Wednesday, April 16 at 12:01 AM. I will announce the winner later that day on my blog. Please leave me your e-mail address, so I can contact the winner.